When readers leave your website on the first visit, it increases your bounce rate. A high bounce rate means lower search engine rankings. Google and other major search engines take user experience into account when ranking a website. Google’s goal is to display the highest quality web pages that offer the best solution to the user’s query. And if your website has a high bounce rate, Google will drop your site like a stone. So, if you want to get on the first page and stay there, you need to make sure people spend more time on your site and bounce less. Now, there are a lot of ways to increase the number of pages people visit on your website. But the easiest of all is to display related posts at the end of every post. This will not only reduce your bounce rate as people might click through to read another post or two but will also increase the time people spend on your website. Both of which are a quality signal for Google. And of course, it will increase your page views. If you want to display related posts on your blog, you can either manually add the code to your theme or use a WordPress plugin. If you are not interested in installing a related posts plugin on your website, you can manually add related posts functionality to your theme. The above code will pull posts related to the same tags as used by the current post. When using this code, you will have to make sure that you tag all the related posts using the same tag. This is the easiest option of all. All you have to do is install a related posts plugin to your website. Using a WordPress plugin to do the job is far better than hard coding the functionality into the theme you are using. When you manually add code to a theme, the related posts will stop showing up as soon as you change the theme or install a new theme update. Moreover, a plugin will also handle the design part, unlike the manual option. While this is the easiest option, one thing you should know is that most related post plugins are resource intensive. This means you might have trouble running them on your website if you are on a shared web host. If you are on a shared web host, you can easily get around this problem using the Manual Related Posts plugin. It’s a simple tool that allows you to select posts related to a post. If you use the Jetpack plugin on your site, you already have the functionality for related posts – you just need to enable the module by visiting “Jetpack” > “Settings” > “Traffic” and turning on the related posts section. You can then choose whether to include the header text and images. You can then customize the “related posts” text by visiting “Appearance” > “Customizer. The good thing about using the Jetpack plugin to handle your related posts is this processing happens off-site on the WordPress.com servers so this plugin is safe to use on shared hosting and you can be sure it won’t slow your site down. Related Posts is a free plugin that adds related posts right after your content. It displays related posts arranged in columns along with their thumbnails. You can customize the background color, border color, text size, text color and excerpt length. It also allows you to customize the thumbnail size and the type of relation. You can choose from multiple types of relations including tags, categories and tags, categories, and custom taxonomies. This plugin also allows you to randomize the relation of the related posts. Displays related posts with thumbnails. Allows you to customize background color, border style, text color, text size, and title and excerpt length. Displays related posts in columns. Multiple relations to choose from. Related Posts By AddThis is a free tool by AddThis. AddThis is a free suite of tools that help you increase your website traffic. When you sign up for AddThis, you get access to multiple tools including Content Recommendation. The Content Recommendation tool helps you display recommended (related) content from your website on every post. This plugin helps you display two different types of recommendations. One is called What’s Next which is displayed on the bottom right or left side of your website. It shows up when the user starts scrolling through your content. The other is called Recommended Content Footer. As the name suggests, it displays related content at the end of your posts. The best part about this plugin is that the resource intensive login doesn’t run on your website servers. Instead, it runs on AddThis’ servers. Two different types of recommendations available. Multiple designs to choose from. Offers multiple free tools when you sign up. Yet Another Related Posts Plugin (YARPP) is a free WordPress plugin. It offers a unique algorithm to help improve the accuracy of the related posts displayed. Unlike other plugins, YARPP uses its own algorithm that takes into account more than just tags, categories and custom taxonomies. YARPP also allows you to display sponsored content which is a great option if you are looking to increase the revenue of your blog. While YARPP is one of the best related post plugins, it is also one of the most resource consuming related post plugins. Because this plugin consumes a lot of resources, it’s blocked by most Managed WordPress Hosting providers including WP Engine and Media Temple. Offers a template system to help you customize all aspects of the design. Related Posts by Taxonomy, as the name suggests displays related posts by taxonomy. It’s a lightweight plugin. It comes with dozens of customization options. You can display posts with thumbnails or as plain old links. This plugin doesn’t offer much customization options and the design is a bit outdated. But it still gets the job done. If you don’t like the default design, you can create your own HTML templates for the plugin. Shortcodes allow you to display related posts anywhere you want. Allows you to include and exclude terms from the search. Displays posts with the most terms in common first. Yuzo is a totally free WordPress plugin. It is one of the most popular related post plugins for WordPress. It offers a lot of customizations options. You can customize the thumbnail size, background color, height, width and many more other details. Yuzo offers a beginner-friendly interface that is both easy-to-use and powerful at the same time. It is one of the fastest related post plugins available. It caches all the data to save resources and speed up the process. Lightweight and less resource consuming. One of the fastest options available. Caches to save server resources and time. Contextual Related Posts is a resource intensive plugin. And just like YARPP, it is blocked by most Managed WordPress Hosting providers including WP Engine and Media Temple. This plugin won’t cause much of a problem on a small site. But as the number of posts increases, this plugin might slow down your website and consume more resources. This plugin comes with dozens of customization options and uses a custom algorithm to improve the accuracy of the suggestions. You can customize the design by creating your own HTML templates. Comes with support for Shortcodes allowing you to display the widget anywhere in your content. Offers a widget you can add to the sidebar of your website. Uses caching to save resources and speed up the process. Automatically displays related posts after content. No need to edit the template files of your theme. The algorithm finds posts from the title and/or content. Exclude posts from certain categories. You can also exclude posts and pages by ID. Related Posts Pro is a popular premium plugin that displays related posts after your content. It offers dozens of customization options and comes with three beautiful layouts. It comes with 65 pre-designed templates for each layout. With this plugin, you can also choose to display related posts from custom taxonomies created by different plugins like WooCommerce and bbPress. 65 beautiful pre-designed templates to choose from. Three different layout options available. Offers a clean user-friendly backend. Offers optional navigation buttons for the related posts. Allows custom post types from different plugins including WooCommerce and bbPress. 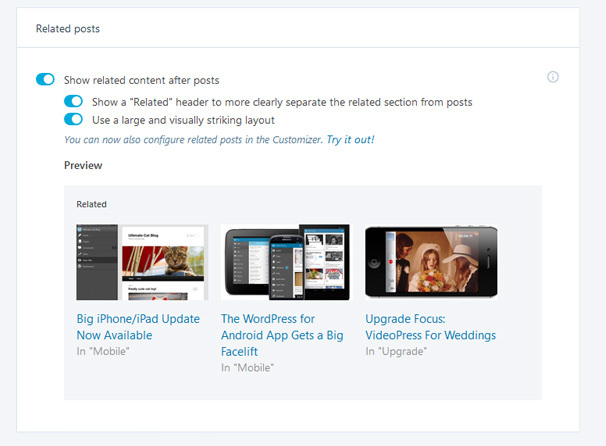 Better Related Posts Widget is a premium WordPress plugin. It allows you to customize the thumbnail size, text color, number of items, and widget titles. It also allows you to display multiple instances of the same widget on the page. You can choose to display Author Name, Publication Date, Number of Comments, Post Thumbnails, and Excerpts. It allows you to choose the taxonomies to display posts from and caches the suggestions to speed up the process and save server resources. Customize the size of a thumbnail, the length of excerpts, the number of items shown and the widget title. Display author name, the number of comments, excerpts, post thumbnails and publication date. Inline Related Posts allows you to display related posts in between your content. You might have seen this kind of suggestions on popular news websites such as Business Insider, Wall Street Journal, and Forbes. It’s a totally free plugin. While this plugin will help you improve your bounce rate and get more traffic, you will need to install an additional plugin if you want to display related posts in your sidebar or after your content. Allows you to choose when and where the suggestions are displayed. A great way to decrease bounce rate and increase traffic. Related Posts for WordPress is a free WordPress plugin. It offers dozens of customization features. You can customize almost all aspects of the design. It not only adds related post suggestions after your content but also allows you to add them to your sidebar. You can also use the shortcode to display suggestions anywhere in your posts. Allows you to use shortcodes to display related posts anywhere in your content. Offers a widget to display related posts in your sidebar. Displaying related posts in your content is a great way to reduce bounce rate and increase page views. Moreover, it also helps you automatically interlink the posts on your website. While using a plugin will give you a lot more functionality, it will also consume more resources so you should watch how your site responds if you are on shared hosting or choose a plugin such as Jetpack which does the processing on their own servers so won’t affect your site speed. Thanks for the list. In my opinion, Inline Related Post is one of the best plugin. It’s a pity that the plugin is not updated frequently with new features.